Preheat oven to 350°F. Remove outer papery layers of skin of garlic and cut off the top 1/3 of each head. Place garlic head(s) root-side down in a small, ovenproof dish and drizzle 1 tablespoon of olive oil over each. Sprinkle with salt and pepper, and cover with aluminum foil. Bake for at least 1 hour. Allow to cool. 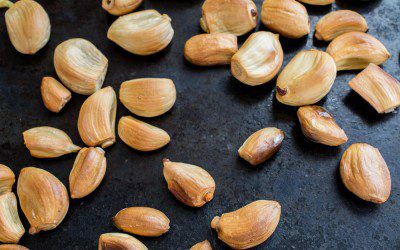 Roasted garlic cloves can be squeezed out of their skins and used directly in a recipe. Unused cloves can be stored in a glass or plastic container in the refrigerator for approximately two weeks. Leftover roasted garlic may be used in a sauce over pasta, spread on bread, or added to a salad dressing. Johanna Burani is a dietitian and certified diabetes educator at Nutrition Works in Morristown, New Jersey.